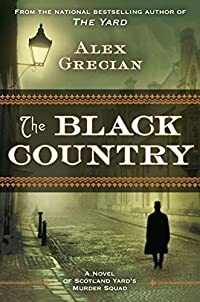 The Black Country by Alex Grecian: Synopsis and Online Purchase Options. Synopsis (from the publisher): When members of a prominent family disappear from a coal-mining village — and a human eyeball is discovered in a bird’s nest — the local constable sends for help from Scotland Yard’s new Murder Squad. Fresh off the grisly 1889 murders of The Yard, Inspector Walter Day and Sergeant Nevil Hammersmith respond, but they have no idea what they’re about to get into. The villagers have intense, intertwined histories. Everybody bears a secret. Superstitions abound. And the village itself is slowly sinking into the mines beneath it.